One of the best things about a blog is the ability to add different types of content. I have written about creating images and visualisation. However, the next step in powering up is incorporating different content, such as video, audio and gifs. There are so many different options when it comes to making video for a blog. Whether it be a telling a story with images using PhotoStory, creating an animated presentation with Powtoon, celebrating voice with Adobe Voice or simply using a camera to make a live recording. When it comes to adding video content to a WordPress blog, the easiest way is to simply add it via the media library. The issue with this though is that whatever blogging platform you are using, there is always a limit to how much you can store. In addition, there are also limits associated with the size of single files. For example, the limit with Global2 is 50mb. The solution then is to store the videos somewhere else and embed them within the blog. One alternative is to store content within Google Drive and embed it. To do this you upload the video file in question then click to pop it out. Once it is open in a separate space, you click on the options tab where you will find the embed code. Other than having more control over the content, a benefit of using Google Drive is that you are able to apply restrictions as to who can and can’t view the content through the ‘share’ settings if that is a concern. Often we associate adding audio to a blog with creating an episodic podcast. However, the process does not always have to be that complicated. You can easily create a one off recording and add this to a post. This can be useful when it comes to musical creations or one off interviews. See for example Doug Belshaw’s interview with Bryan Mathers or Dean Shareski’s response to Bud Hunt. Levelator to even out the volume. Audacity to cut-up and remove unwanted parts. It is also suggested that you use a proper microphone rather than the in-built microphone within a computer or tablet if recording, as this will improve the quality of the audio. In relation to adding to a blog, you can embed using sites like Soundcloud and Audio Boo. However, the easiest option is often just adding an MP3 file to the media library and inserting this. You can use a plugin to add further feeds and functionality, but this is not always needed. A GIF is a is a type of loop-able image that lasts for only a few seconds. It stands for graphic interchange format. Originally designed for icons, these silent images can be used for a wide range of purposes. For some they are used to tell stories, while for others to present a quick tutorial. You only have to look at platforms like Vine and Instagram to see the power and potential of GIFs (although technically speaking, neither of these platforms produce GIFs). There are more, it just depends on what device you are using and what you are trying to create. I have written more about GIFs here. Overall, there are so many other different options for embedding content that helps to power up, for more details see the long list at Edublogs. Powering Up Blogs By Adding Content by Aaron Davis is licensed under a Creative Commons Attribution-ShareAlike 4.0 International License. Lovely post, Aaron. Thanks. 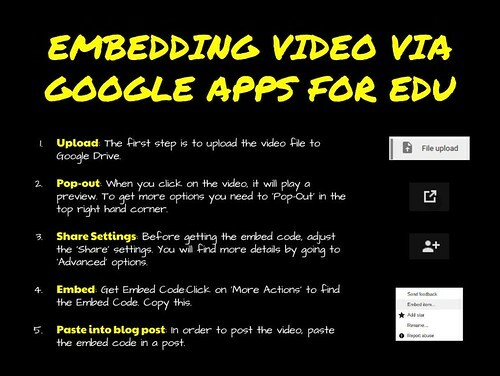 I love your tip about embedding video from Drive. I’m not yet sure when I’m going to use it, but I’m sure I will, and I’ll certainly get students to embed video into their portfolios this way. Brilliant, thanks. This information is timely and helpful! Thanks to Joe Sanfelippo (@Joesanfelippofc), I am playing around with a podcasting app called AudioBoom (https://audioboom.com/). While the writing helps with my reflection and learning process, I appreciate and acknowledge readers being drawn to the various media you mention. WordPress certainly has it’s appeal, but one reason I’m hanging on to Blogger is the ease with which I can insert resources from Google apps. 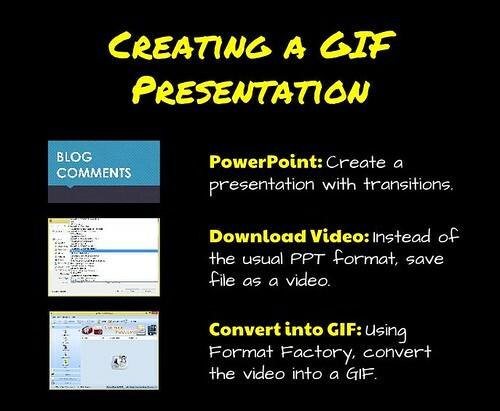 I have wanted to learn more about creating animated GIFs, so your suggestion are going to help me get started. Thanks again for being a staple of my learning.